We would like to invite you to advertise in one of our programmes. Produced to a very high standard by a local printing company, our programmes are treasured by our concertgoers, many of whom keep them as a memento of the concert. Before a concert you will always find many concertgoers looking through the programme whilst waiting for the concert to start. This is a prime time for you to bring your message to them. With up to 400 audience members at our town hall concerts, they could be a reading your message at our next concert. 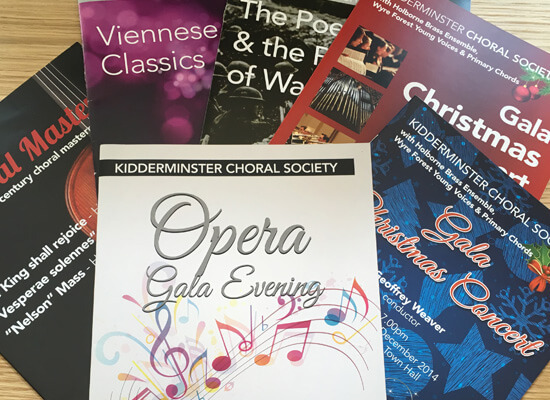 These rates are for a full season of advertising with Kidderminster Choral Society, and your advertisement would be featured in the programmes for all three main concerts, in Spring, November and the sell-out Christmas concert. Please contact our Publicity Officer if you would like to advertise with us. Yes I would like to receive marketing materials from Kidderminster Choral Society.